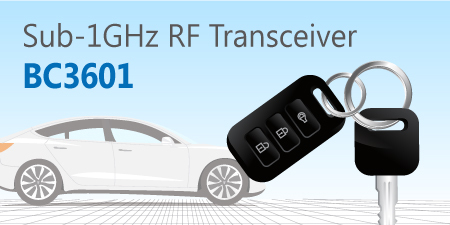 Holtek is delighted to announce the release of its new bidirectional wireless FSK/GFSK high performance transceiver IC, the BC3601. This device, which operates in the 300MHz~960MHz license-free ISM bands, is suitable for battery or IoT applications that require low power consumption, such as smart homes, intelligent security products, car alarms, industrial/agricultural controllers and many other wireless bidirectional communication products. The BC3601 includes a fully integrated high power programmable amplifier, a frequency synthesizer and a digital demodulation function, etc., greatly simplifying the peripheral circuit design. The RF characteristics of the device are compliant with ETSI/FCC specifications. The device has an operating voltage ranging from 2.0V to 3.6V and a programmable transmitting power up to +17dBm. Its receiving sensitivity is up to -118dBm at a data rate of 2kbps and its transmission rate is up to 250kbps. The device also includes an ATR (Auto-Transmit-Receive) function and an integrated high precision, low power oscillator for WOT (Wake-on-TX) and WOR (Wake-on-RX) functions. The BC3601 includes an SPI control interface and meets with the industrial specification operating temperature of -40°C ~ 85°C. It is supplied in a small 24-pin QFN (3mm×3mm) package type which will meet the requirements of thin profile wireless product and module designs.